Managing director of G & H Civil Contractors, Demolition & Plant Hire, Padraig Haskins, wouldn’t have ever thought that when he was growing up on a small farm in Ireland, and then completing his apprenticeship as a fitter in a chemical company, his future would see him running a successful plant hire and demolition company on the other side of the world. It was always Padraig’s brother who was interested in the earthmoving side of things, but after moving to Sydney in 2005 where Padraig was employed working on the M7 and then moving on to manage a plant hire company in Queensland, his path was laid out in front of him… and G & H Civil Contractors, Demolition & Plant Hire was born in 2008. G & H Civil Contractors, Demolition & Plant Hire is co-owned and run by Padraig and his business partner Noel Grealish. Padraig and Noel have a hands-on role in the day-to-day operations of the business, including organising employees and machinery, estimating and even operating machinery when the opportunity arises because Padraig still finds this one of the best ways to relax and clear his mind. Padraig and Noel find when they are both actively involved in the day-to-day of the business it allows the luxury of taking time off when needed and allows substantial progress to continue across all work sites, even when one of them is required on the numerous interstate worksites. “We offer a vast array of services for our clients from start to finish on their projects. 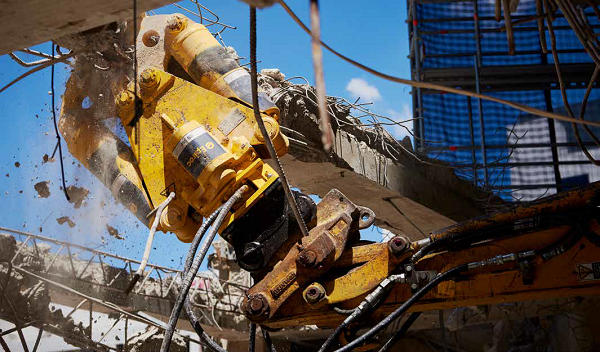 We provide our clients with cost-effective and time-saving solutions to deep excavations, high rise demolition, full subdivision packages, sewer stormwater gas and water pipework and comms, road and rail work. We have a wide range of clients from councils to tier 1 builders, Moreton Bay Council, Watpac, Morris Property Group, Hutchinson Builders, CPB, Acciona, Coleman Rail, Geotech and the list goes on,” said Padraig. G & H have about 85 staff spread across QLD, NSW and ACT. The majority of their team are between Brisbane, Gold Coast and Canberra. When it comes to equipment G & H has a wide array of machinery available for their clients ranging from 1 tonne to 100 tonne excavators with a range of Epiroc (formerly Atlas Copco) rock breakers, rock saws, plate compactors, concrete pulverisers, steel sheers and magnets to suit all size machines. Long reach excavators, D6 to D11 Dozers, grader loaders and skid steers are also essential parts of their fleet. The company also has their own trucks ranging from semi side tippers and high side demo bins, 10×4, 8×4 EJECTX ejector trucks and watercarts. There are about 80 machines and 25 attachments from BA Equipment. The right equipment is paramount to being successful in this industry so I asked Padraig his take on the subject. He shared, “Without having the correct equipment to do the job, you are going to cost the client time and ourselves money. We have heavily invested in buying the top brands of machinery and keeping it up to date because it saves time and money having the correct machine for the job. “Over the years we have upgraded our machinery, which has made significant impacts on safety, time and productivity. We are always looking for new ways to enhance safety and save time on projects, and new modern machinery has been the way we have made that happen. 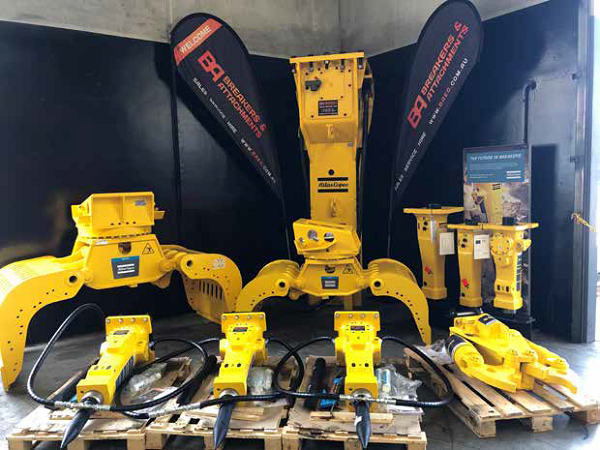 The new Epiroc attachments over the past two years, from the SB302 rock breakers for our 5 tonne excavators, the HB7000 on our new Volvo EC750, the new CB350 concrete pulveriser and the HM1500F hydro magnet have all made an enormous impact – from lower noise to more production they have definitely stood out as some of the best decisions on purchases we have made. The solid body rock breakers (SB) are a significant part of our outfit and the perfect choice for demolishing light concrete structures. Time efficiency is massive in this game so any attachment or equipment that can save time is massive for both clients and G & H. The Epiroc Hydro Magnets have been one such item that has saved a huge amount of time on site and is the best way to pick up valuable scrap metal and turn it into profit. Another huge benefit is protecting valuable staff and equipment by keeping the ground clear and safe. “We are currently running 12 jobs across Queensaland, NSW and ACT. Some of which are the civil works at the new MILVEHCOE military base for Watpac in Queensland, Stormwater upgrade for Morton Bay Council, and deep excavation for Hutchinson Builders on multiple sites in Brisbane. 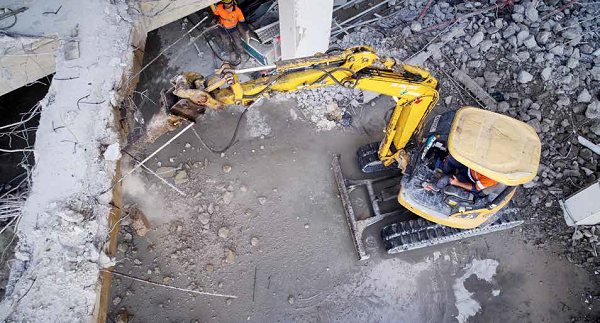 Also, on the go at the moment is the deep excavation of the new hospital precinct at Herston Brisbane for Watpac, Subdivision (stormwater and sewer upgrade) for a private developer in Tweed NSW, and a 16 story demolition for Morris Property Group in Canberra. With this many jobs on the go, the reliability of our attachments from BA Equipment Group has been a massive part of our success. Since day one of G & H, BA Equipment Group has been the supplier of our equipment. They sold our first rock breaker, twin header drum cutter and rock saw to go with our first machine almost 10 years ago and helped us along the way to where we are now. BA Equipment Group are very easy to work with when it comes to the equipment needed; they understand the industry we work in and the need to have machinery working at its best to get top productivity. BA Equipment Group always have stock of any wear items and are very quick to act on any breakdowns. You can’t ask for any more when it comes to such an essential aspect of your business.